One of India's most popular entrepreneurs, Deep speaks about what it takes to build a business based on e-commerce in a dynamic market like India. By the end of his talk, Deep promises to leave the audience thinking out of the box and brave enough to risk pursuing the idea they believe in. A pioneer in the emerging e-commerce industry of India, Deep has disrupted the traditional concept of travel. 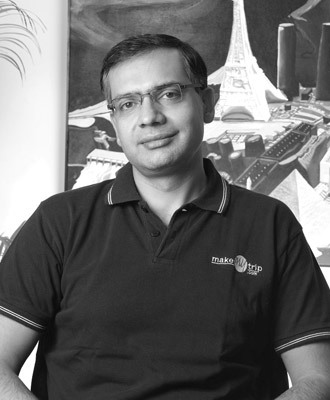 Winning every possible entrepreneurship award, he has steered MakeMyTrip.com to become the country’s largest e-commerce business as well as the biggest travel company. After stints at GE Capital, AMF Bowling Inc. and ABN AMRO Bank, Deep launched MakeMyTrip.com in India in 2005—after inception in 2000—with the objective of offering the convenience of online transactions coupled with great value prices. Not only did it change the travel industry—inspiring a slew of travel websites—it also paved the way for the rise of e-commerce in the country. A member of the NASSCOM Executive Council and also chairing its Internet Working Group, Deep also serves on the Board of TiE Delhi, is closely involved with CII and FICCI as part of their Travel and Tourism sub-committees and is a regular speaker at internet and travel conferences across the globe. Deep pays it forward by being an active angel investor in the internet space.